I’m not a natural audience for books about surviving disasters (even though I wrote theGlobal Warming Survival Kit). I can’t stand disaster movies, because I can’t take the pragmatic ‘Oh well, some survive,’ viewpoint as I watch millions perish. So I thought that I would find this book, with its subtitle How Humans will survive a mass extinctionsomewhat unappetising – but I was wrong. The Earth has gone through a number of mass extinctions, where a fair percentage of living species have been killed off. The most famous is the one that mostly took out the dinosaurs around 65 million years ago, but there have been others and, Annalee Newitz points out, if we want to see the long term survival of the human race, we need to be able to make it through one, should it turn up, whether caused by climate change, pandemics, a supervolcano or an asteroid. What Newitz does surprisingly well here is weave together what are really around four different books, all in one compact volume. We start of with palaeontology, looking back over previous mass extinctions, getting a better understanding of what happened, what survived and how it survived. From here we segue into human pre-history and history, drawing lessons from the plight of the Neanderthal and the impact of plague and other pandemics. 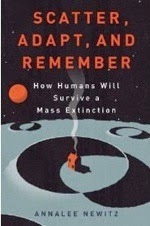 After this, in a transitional section we see the examples of the three techniques in the book’s title – scattering in the Jewish disaspora, adaptation in cyanobacteria (and how we could use it) and remembering on the part of the gray whale, before taking another transition into a more science-fiction driven view. Newitz starts by pointing out the potential lessons to be learned from the SF writing of Octavia Butler who is apparently ‘one of the 20th century’s greatest science fiction writers’, which I was a bit surprised by as I read a lot of science fiction and I’ve never heard of her. The segue here is into the shakiest part of the book where it dabbles in futurology. This broadly divides into relatively short term survival approaches and longer term diaspora into space. One of the reasons this is the weakest part of the book is that Newitz offers us castle-in-the-air solutions with no obvious way (and certainly no hint) of how to get there from where we are now. So she says we will need underground cities if we need to survive some kinds of impact, while we would be helped by building green cities that merge biology and construction… but it’s not clear how we would ever get started on such major, long term projects. She doesn’t address the reality that humans are very bad at taking the long view. I was, though, pleasantly surprised by this book, particularly the first half. This is genuinely interesting and thought provoking, up to and including the Octavia Butler section. And though it goes a little downhill after that, it never fails to be readable and interesting – just a little far fetched. So congratulations to Newitz on taking the rare long view – and in having optimism for our ability to survive what the universe can throw at us.